This semester kicks off the second round of Sharing My Purpose, a TED Talk-style presentation given by members of the Pacific community that highlights the speakers’ personal stories, identities (race, gender, religion, class, etc. ), and significant life moments that led them to find their purpose. Last semester we highlighted Pacific faculty and staff, this semester we are showcasing our students. 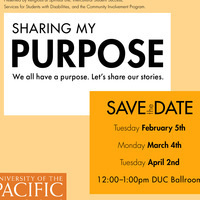 Sharing My Purpose is a wonderful opportunity for Pacific to learn who our students are so we can better support them. Bring your lunch – light refreshments will be provided. Three students will share their story, followed by a panel discussion for Q&A. We hope you will join us for an opportunity to be inspired.